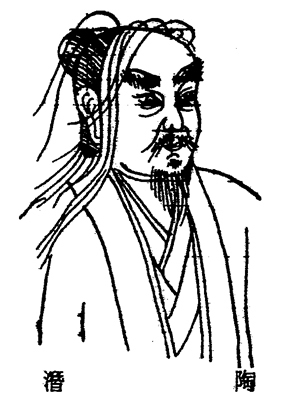 Tao Yuanming (365 - 427) is "generally considered one of the two or three greatest pre-Tang poets. "4 He used quite a few names, including 元亮 Yuanliang, 陶潛 Tao Qian, 陶五柳 Tao Wuliu (五柳先生 Mr. Five Willows) and 陶靖節 Tao Jingjie (靖節先生 Mr. Aloof). His was originally from 潯陽柴桑 Chaisang in Xunyang, an area near Jiujiang, on the south bank of the Yangzi river in Jiangxi province. 何勞絃上聲？ Why make the effort to put on the strings and make sounds? This attitude has often been criticized. Comments about him in Qinshu Daquan include the following. Tao Qian, style name Yuanming, was from Chaisang in Xunyang.... Further details in preparation. Copied from ZWDCD 42642.181, which does not identify the source. Folio 19A, #24 to #30 Compare also the idea of there being no need to play the qin when already have the sounds of nature (see image). This is said to be from a poem by Tao Yuanming called "無絃琴 Stringless Qin", but it seems to survive only as a couplet. "樂琴書以消憂 happy to have my qin and books to dispel melancholy." Return to QSCB, or to the Guqin ToC.